The YoY growth we witness here symbolizes the progress of e-commerce industry in Malaysia, thanks to the collective efforts from MDEC, PIKOM, their merchants and partners, as well as everyone who contributes in some way to the ecosystem. 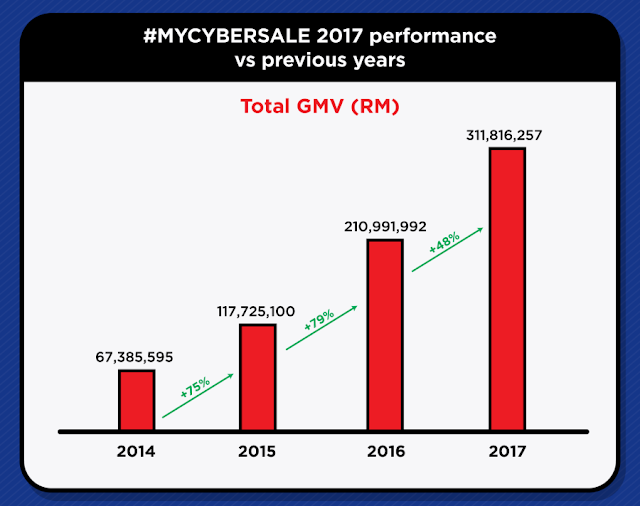 While the #MYCYBERSALE 2017 infographic we published earlier focus on overall results and own store VS e-marketplaces analysis, this second and last installment of infographics demonstrates the Year-over-Year (YoY) growth of #MYCYBERSALE from previous editions. As usual, you can either digest the whole infographics here via Pinterest or read on as we break down the YoY trend by sections. As #MYCYBERSALE makes its name over the years, it is no surprise that more and more merchants participate in this annual event. 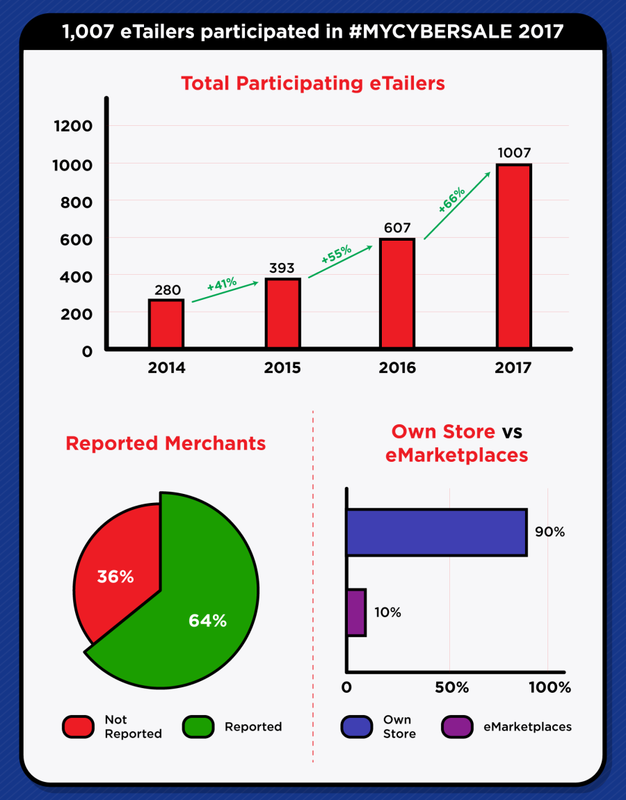 From 280 in 2014, there are now 1,007 participating merchants in the 2017 edition. A point to note here, 90% of the participating merchants are own-store merchants, meaning they run their own branded online store. The remaining 10% are e-marketplaces or multi-categories websites. 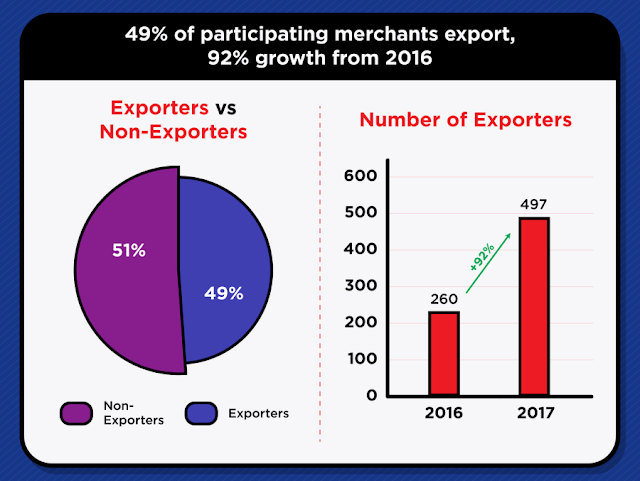 We are seeing a good sign here as 49% of participating merchants are exporters or 497 in total to be exact, a 92% YoY growth from 2016. As shown in the previous infographics, a big chunk of export GMV (Gross Merchandise Volume) is contributed by online travel businesses, followed by fashion merchants. Now, let's chart the growth of total GMV from 2014 to 2017. As you can see from the graph above, total GMV - including both local and exports - has grown from RM211M in 2016 to RM311M in 2017. Even if the YoY growth rate of +48%, from 2016 to 2017, is lesser than previous years, this is still significantly higher than 20 to 25% YoY e-commerce growth rate forecasted by multiple sources here. If we break the total GMV chart earlier into local VS export, local GMV has grown +36% from RM200M in 2016 to RM272M in 2017. 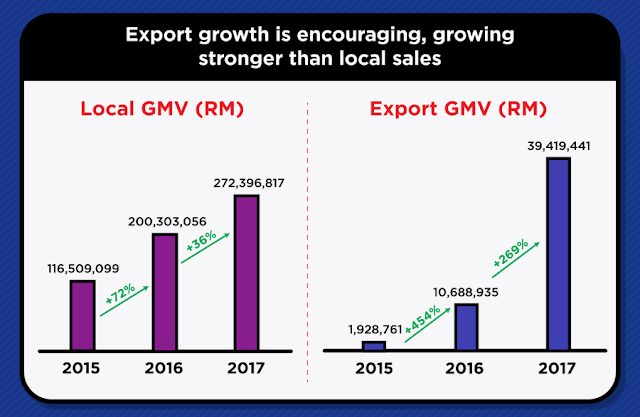 Comparatively, YoY growth of export GMV has outpaced local GMV, registering +269% growths from RM11M in 2016 to RM39M in 2017. So what does that all mean? Local e-commerce merchants are growing their exports and we can be pretty sure that there are still plenty of export growth opportunities, especially after the launch of DFTZ. As we know that most of the e-marketplaces focus on the local market, so it is not a surprise that 81% of export GMV is contributed by own-store merchants. Of course, the local GMV contribution by e-marketplaces is huge at 69%, compared to those who operate with their own stores. If we combine both local and export, it is 63% of total GMV by e-marketplaces and 37% by own store. This concludes that it is a wise for most aspiring e-commerce merchants to adopt multi-channel selling approaches so that they get the best of both worlds.